Concrete Asia 2016 is an international exhibition and conference for concrete and building construction professionals with a focus on the industry’s latest technologies and techniques. Held alongside Asian Construction Week, from 21-23 September, 2016, more than 25,000 square metres of the newest innovative products will be showcased. Reaching out to the 600 million population in ASEAN; the event provides an opportunity to meet manufacturers and suppliers, increase sales and ROI, as well as create awareness for your brand; thus tapping into new opportunities in this growing market. The event will cover the latest topics in concrete technology and techniques, decorative concrete, material handling, concrete production, cement, construction equipment, machinery and more. Key event happenings include The ASIAN Concrete Conference 2016, Tunnelling Practice in Asia Conference, and several other seminars on trending topics by renowned speakers. A first in Thailand, outdoor demonstrations depicting how polished concrete is manufactured will be on display for the concrete decoration industry. Concrete batching plants will also be on the show floor. The ASEAN region on its own is a trillion-dollar economy with growth expected to reach US$4 trillion in 2020 and is the perfect market for the concrete industry. Renowned Thai and international industry speakers will converge to update members of the local and regional concrete construction industry on relevant industry topics such as Tunnelling & Concrete Technology. These are the efforts that will reshape Thailand’s infrastructure, as more than 450 exhibitors and brands and thousands of trade professionals from across the region meet to discuss industrial trends and network. 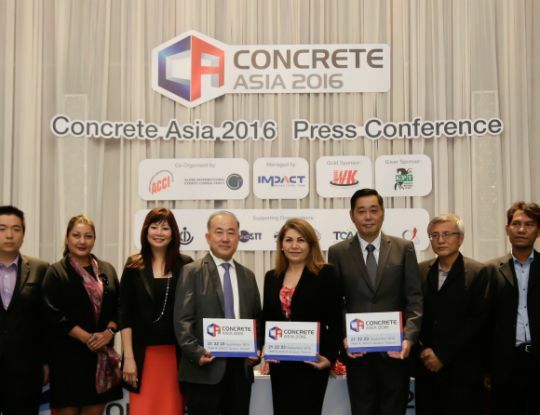 A hosted VIP buyer programme reaches out to more than 120 regional key buyers to facilitate close door buyer-seller meetings at Concrete Asia 2016.